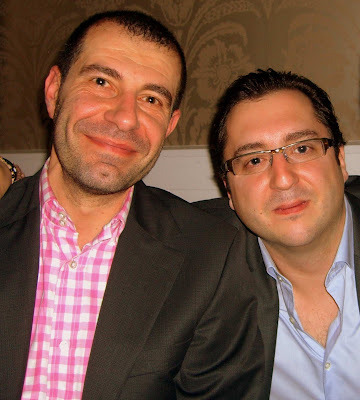 Last week I was lucky to attend the second-only wine dinner hosted by Restaurant Orsay. It’s no secret that I love Orsay, and this well-planned, impeccably-executed, entertaining and tasty affair was further evidence of the restaurant’s thoughtful and classy approach to every dish, every meal, and every event they compose. It may come as a surprise that this tempranillo wine dinner was only the second such event to take place at a restaurant with a demonstrated commitment to maintaining an interesting, informative, and lengthy wine list. Crystal Vessels, Managing Partner at Orsay, explains that she and Chef Brian Siebenschuh have extremely high standards when it comes to hosting a wine dinner. According to Crystal, “they have to be incredible wines, they have to provide the guest an amazing value and experience, and the guest speaker of the evening not only has to be someone with real impact from the winery, but also a great entertainer.” Crystal hopes that these components will provide for an unforgettable, fun, and very un-stuffy evening. Orsay delivered on all of these elements. The guest speakers and ambassadors from the two Spanish wineries represented at the dinner were awfully entertaining. Before dinner was served I practiced my embarrassing Spanish on these three charming gentlemen while drinking a cava rosada and enjoying Kumamoto oysters accented by tiny gelée cubes of vinagre de Jeréz. Along with providing guests with a mini-Spanish lesson, Juan Carlos “JC” Marin gave a short introduction to the wines we were to enjoy and explained how his distributorship, Stacole Fine Wines, makes sure that each and every wine they represent is carefully handled and treated as a living, breathing entity on its often lengthy journey to our tables. Bodegas Muga in Spain’s Rioja region was represented by Juan Muga, and David Espinar attended on behalf of Bodegas Emilio Moro from Ribera del Duero. These two regions both produce Tempranillo and the event was intended to showcase their different styles and approaches. The dinner started off with a genius pairing. Pan-roasted red snapper was perched atop a bed of pickled fennel, frisée, and blood orange segments and surrounded by a blood orange reduction. 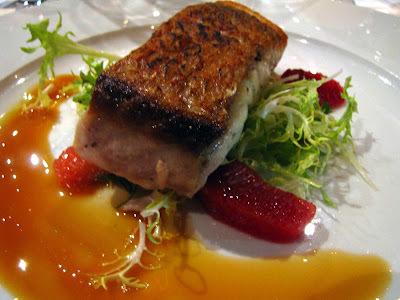 The dish was paired with Bodegas Muga 2008 White Rioja and 2008 Rose Rioja. While both wines worked well with the overall plate, I was very impressed with the way the tart blood oranges and reduction perfectly complemented the gently sweet rose. The rest of the meal also benefited from Chef Brian’s never-fail culinary aesthetic: clean flavors, solid techniques, and high quality ingredients. For this meal, the chef highlighted the local where appropriate but also took advantage of his ability to procure the best ingredients from around the country and indeed the world. Sometimes I think restaurants adhere a bit too strictly to an “only local” mentality, when a splash of exoticism or an external influence might be just the thing to elevate their flavors and menu to the next level. For this reason, I really appreciate Orsay’s “we’ll give you the best of what we can get” approach. In the case of this wine dinner, Chef Brian incorporated a number of Spanish or Spanish-influenced items into the menu, such as chorizo, saffron, manchego cheese, white anchovies, marcona almonds, and La Quercia “Rossa” Berkshire Jamón, the Americano version of the universally loved Spanish jamón ibérico. 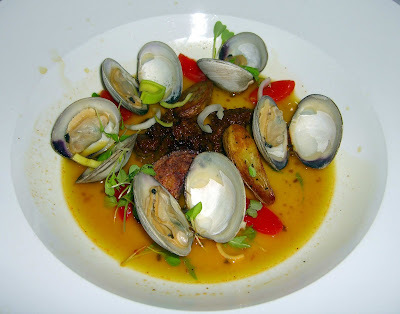 Next up were littleneck clams scattered around housemade fresh chorizo and fingerling potatoes. We were given warm bread to soak up every last bit of the briny, delicately seasoned saffron consommé. This dish was paired with Bodegas Emilio Moro Finca Resalso 2007. 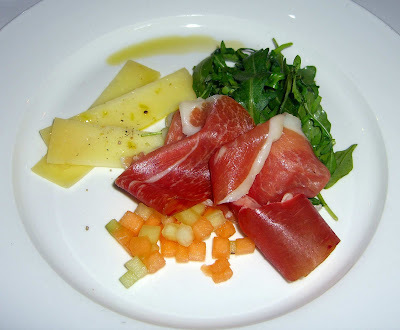 Platters piled with La Quercia “Rossa” Berkshire Jamón Americano were then brought to our tables and served with a few classic accompaniments: queso manchego, cubes of melon, and arugula drizzled with extra virgin olive oil. The jamón was a big hit at my table – rich, beautifully marbled, and buttery. 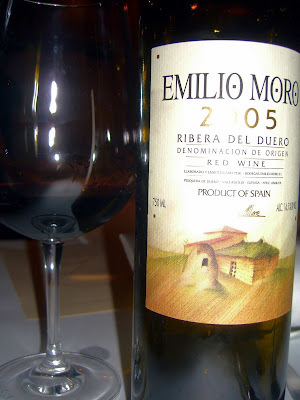 This was served with Bodegas Muga Reserva Rioja 2005 and Bodegas Emilio Moro Ribera del Duero 2005, which according to David is the most classic example of Emilio Moro’s wines. 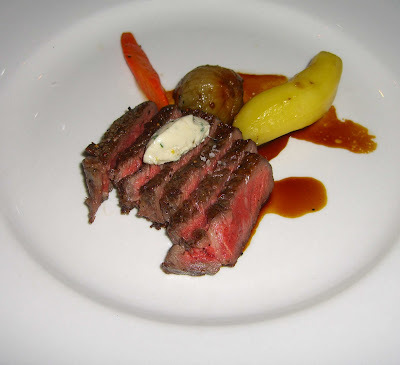 We then moved on to a Strube Ranch Wagyu striploin with roasted potato, carrot, and onion. The meat itself was exquisite and only improved by the pat of white anchovy butter melting over it. The beef was well-paired with Bodegas Emilio Moro Malleolus Ribera del Duero 2006 and Bodegas Muga Torre Muga Rioja 2005. Up to this point, the wine I most enjoyed was the Emilio Moro 2006 Malleolus. That was before we were presented with an unexpected special treat: a taste of the 2004 Emilio Moro Malleolus de Sancho Martin. David explained how this elegant wine sets itself apart from the generally spicy, masculine reds typical of the Ribera del Duero or Rioja regions. 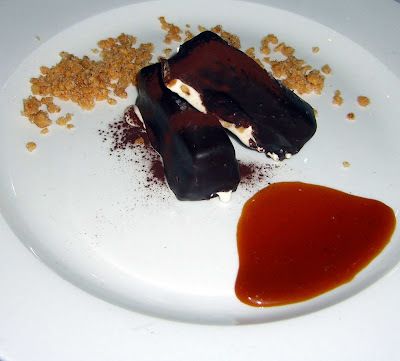 He further noted that it is very successfully paired with chocolate; and wouldn’t you know, out came our final course of Marcona almond nougat covered in Valrhona chocolate and accented with caramel. This dessert was an excellent interpretation of a classic turrón, which I’d never before seen covered in chocolate. Thanks, Orsay, for organizing such a satisfying evening and for bringing to Jacksonville the provocative flavors and charismatic personalities of Spain. Cari, You've done it again. Another informative, interesting, lushly photographed, and well written article. Wish I had been there! Thank you for raising the bar on food writing in Jacksonville. I have just discovered your blog and will now become an avid reader. My husband and I are always looking for really good food and you (and a few other local food writers I've found today) will he helping us out in the future. On this post (Orsay tempranillo wine dinner), I wish I could have been there. I lived in bella España and really appreciate Spanish food and wines. I hope I can find either of the bodegas featured so we can give them a try. @erosazul - glad you found me here at viCARIous! And I am very happy you have found my reviews to be useful. Yes, the Orsay tempranillo wine dinner truly was a magical evening. Try to make it to one of their future wine events, if you can! Crystal really knows what she's doing when it comes to wine, and Brian's food pairings were spot on. Please introduce yourself if you see me at one - would love to meet a fellow Jax food lover!